Group therapy strives towards providing a safe and comfortable setting where you can work out problems and emotional needs with a set of group members who may have similar experiences as you. This setting can help with gaining insight into your thoughts and behaviors, and offer suggestions and support to others. In addition, this intervention can help with improving your relationships, due to having benefits from social interactions that are a basic part of the group therapy experience. 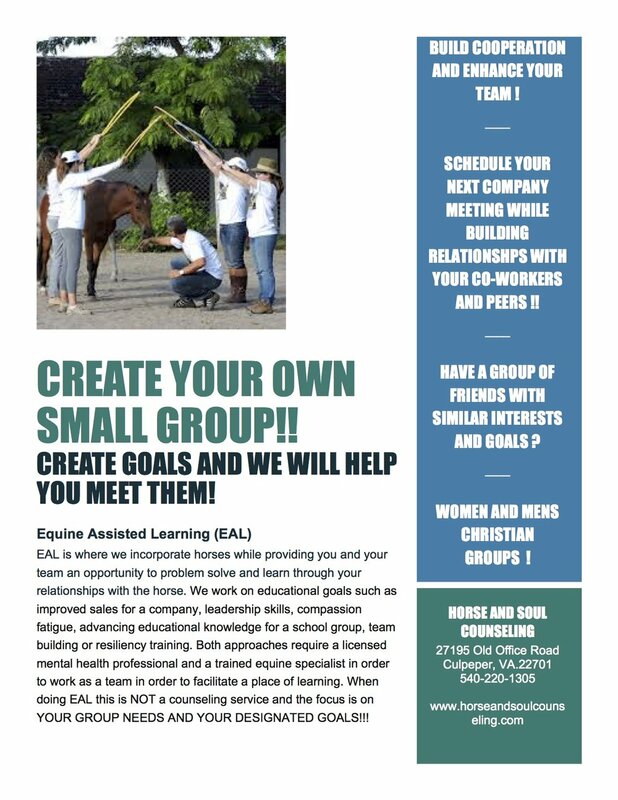 It is the belief of Horse and Soul Counseling that group counseling can be extremely beneficial when integrating equine assisted psychotherapy or equine assisted learning treatment interventions. Groups can be in a traditional or more nontraditional setting with our without integrating horses.